Nashville, Tenn. (February 17, 2017) - GRAMMY® Award-winning Larry Gatlin & the Gatlin Brothers will salute fellow Texan and music legend Kenny Rogers at the 2017 Texas Medal of Arts Awards on Wednesday, February 22 at the Texas Performing Arts Center in Austin. The Gatlin Brothers and vocalist Vikki Carr will perform Rogers' classic hit "Islands In the Stream" before presenting him with the Lifetime Achievement Award. 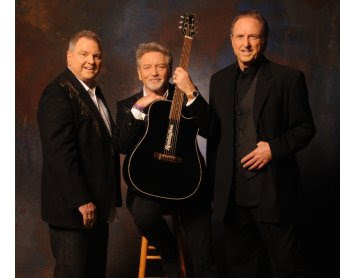 Larry Gatlin and Carr will also perform Rogers' 1980 #1 hit, "Lady." "Brother Steve, Brother Rudy and I were greatly honored to receive the Texas Medal of Arts Lifetime Achievement Award in 2015 and we are honored to have been asked back to present this year's award to our old and good friend, Kenny Rogers," says Larry. "Can't wait to get home to Texas!" The event will begin with a Red Carpet Reception, presented by Anheuser-Busch, at 5:30 p.m., followed by the Awards show at 7:00 p.m. This year, the Awards will celebrate the following honorees who will join the prestigious list of past award recipients: Eloise & John Paul DeJoria of Paul Mitchell / Patrón for Corporate Arts Patron; Kris Kristofferson for Multimedia; Lynn Wyatt for Individual Arts Patron; Lauren Anderson for Dance; Yolanda Adams for Music; Dallas Black Dance Theatre for Arts Education; Renée Elise Goldsberry for Theatre; The Tobin Endowment for Foundation Arts Patron; Leo Villareal for Visual Arts; Frank Welch for Architecture; John Phillip Santos for Literary Arts; Scott Pelley for Journalism; and Kenny Rogers for Lifetime Achievement. The Awards will be hosted by 2001 Texas Medal of Arts Awards honoree and legendary performer Debbie Allen. In addition to live performances by the Gatlins and Carr, the evening's talent lineup includes 2009 honoree Ray Benson, GRAMMY® Award-winning Conspirare, Dallas Black Dance Theatre, Texas Young Masters Nizhoni Begay (Music) and Luke Westerman (Dance), and more. The evening will come to a memorable end with a gala dinner at 8:30 p.m., where guests will dine alongside Texas arts, business, legislative, and entertainment notables. To date, the Texas Medal of Arts Awards has presented 99 medals to 105 Texas legends and luminaries who have achieved greatness through their creative talents, as well as those whose generosity has opened doors to artistic opportunity for Texans of all ages. The Awards spotlight the impact of the arts on the state's economy and our children’s education, preserving the unique and proud Texas culture. The Awards have celebrated various influential and talented honorees including Jamie Foxx, Eva Longoria, ZZ Top, Willie Nelson, Dan Rather, Neiman Marcus, Margaret McDermott, Barbara Smith Conrad, Tommy Lee Jones, Bob Schieffer, Debbie Allen, Robert Rodriguez, Walter Cronkite, Lake Flato Architects, Austin, City Limits, the Nasher Foundation, Sandra Cisneros, Robert Rauschenberg, Clint Black, Anheuser Busch Companies, Lyle Lovett, Texas Monthly, Robert Edsel, and Exxon Mobil, among others.Tickets to the Red Carpet Reception and Texas Medal of Arts Awards show are $100 per person. For more information or to purchase tickets to the Texas Medal of Arts Awards, please visit TexasMedalofArts.org.